Home Parenting Climbing a Hill and Learning A Lesson. You know how we like to go on family days out? I post pictures on instagram of happy smiling children enjoying the fresh air. Good, outdoorsy, wholesome stuff. Family fun. Lots of our family days out are like that. But I’m also committed to keeping it real. So for balance if you will, here’s a report on the one we went on today. We decided, at 3.30pm when all the little errands and housework that we needed to do was done, to go get some fresh air. 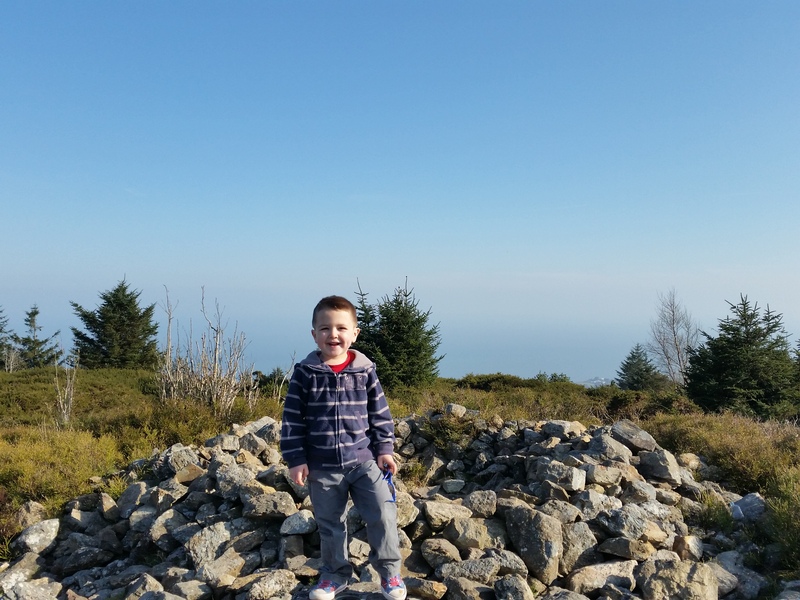 We needed to stay local so we decided to climb Tara Hill. The small girl had slept for about 30 minutes when her brothers woke her banging doors so we decided we’d need the buggy. Yes, to push up the hill. 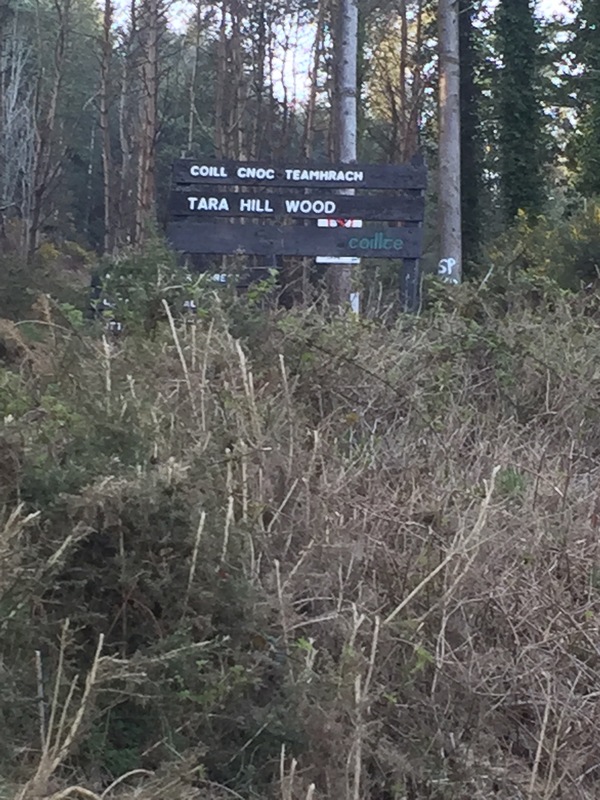 Tara Hill Wood is about 7 minutes drive from our house. 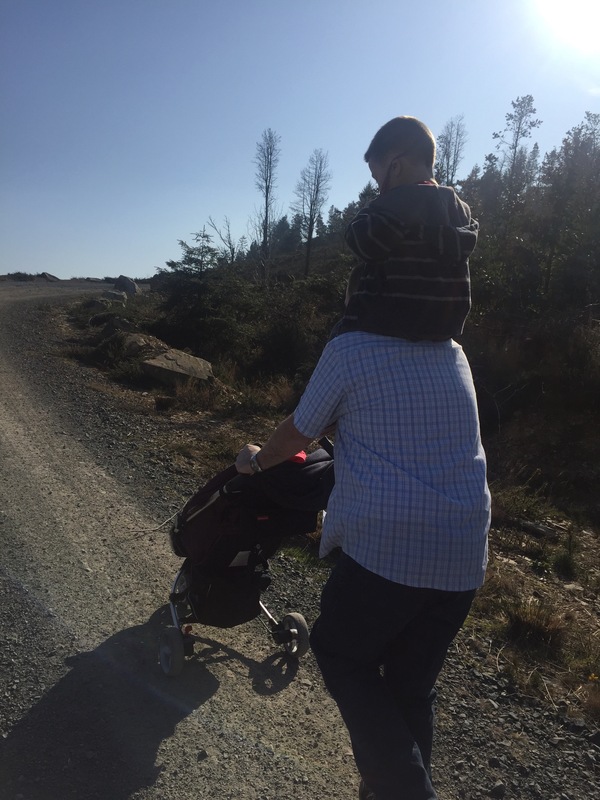 We arrived and unpacked the children, the buggy and the sling. Miss Toddler advised that she would walk. We walked about 50 metres uphill. Miss Toddler asked to be carried. I suggested the buggy. She declined and blocked my path. I suggested the sling. She didn’t think that was a good idea either. I carried her a little. We proceeded. About 3 minutes later Miss Toddler requested to walk. Then she fell, as her “owl-booties” are not the best attire for hillwalking, but they were the only footwear she was willing to have on her feet. I picked her up to comfort her. We walked on. She got down again but up almost as soon as she got down as there were dogs coming which her brothers helpfully heralded by shouting “watch out Laoise there are dogs coming and you’re afraid of dogs”. “Me Fraid” she cried as she signalled for me to pick her up. Another 20 metres covered. (yes, twenty, no typo there). The boys decided to go off the beaten track. We called them back before they caused an avalanche. They told us that they felt we were being unreasonable. (Not in those words). We kept climbing. 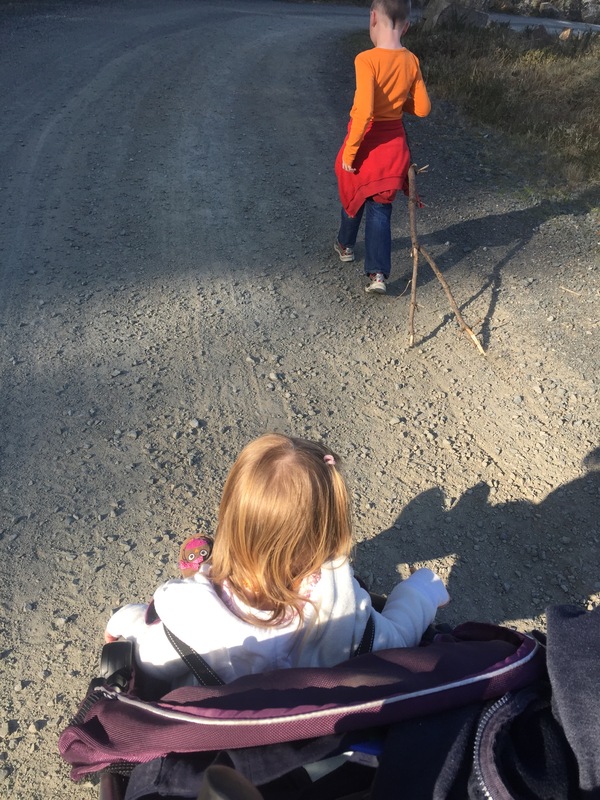 Miss Toddler’s next request to be carried was fulfilled by her Daddy who powered on ahead up the hill leaving me with a tired six-year-old and a buggy to push. My wonky hip started giving out. So did my six-year-old. It was too hot, and he couldn’t POSSIBLY continue without something to eat. I walked slowly with him and we discussed the merits of eating now versus eating at the rest stop. 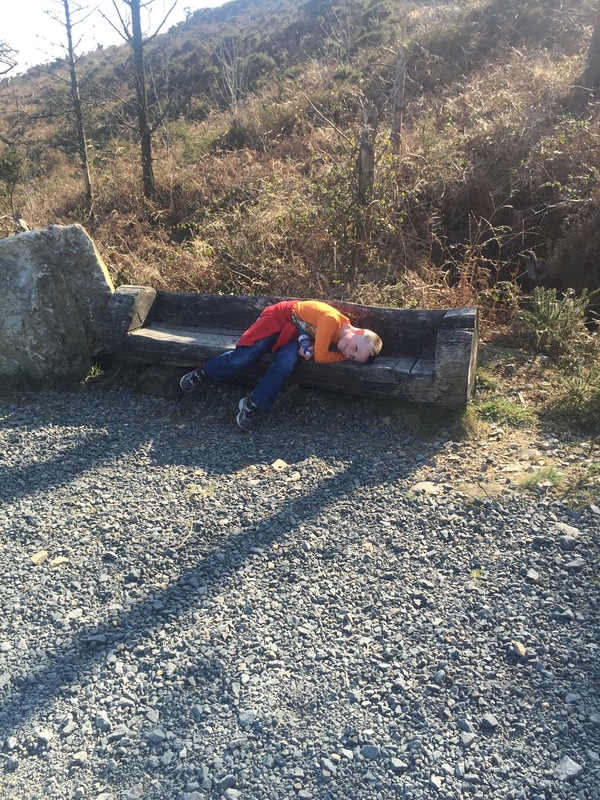 He dramatically announced that he didn’t think we’d EVER make it to the rest stop. I felt he wasn’t over-egging it. This was tough going, and we’d only covered about 300 metres. (I haven’t actually calculated it, I’m guessing, and not very good at sums). The crew out in front stopped for a rest, but as soon as we caught up with them they started walking again, grr. We bribed convinced Miss Toddler to get into her buggy. She ate a granola bar that I later saw berated as being full of sugar on another blog. Oh well. Her brothers BEGGED for their granola bars too. I refused. They suggested that I was being unreasonable. I stood firm. We walked on. And on. And up. And up. Slowly. Miss Toddler got tired of being in her buggy. She remembered the bribe. She turned around “Anythin’ else a eat Mama?”. “I wan’ sumping else eat”. I produced a breadstick. The boys demanded breadsticks. Smaller boy ran ahead with Daddy, he was loving the adventure and the daddy time. Bigger boy hung back with me, proclaiming that he was soooooooo tired. With every turn of the path I convinced myself that this MUST be the last turn before the oasis, the rest area with lovely views. But it wasn’t. We pushed on, the two out in front having a ball, us three behind miserable. I decided to be a quitter, once I got to that rest area I was heading back down that hill. We made it. I told my husband, he seemed relieved to be rid of my moaning and the Toddler Girl’s whines and said he’d continue to the top. We broke it to the kids. 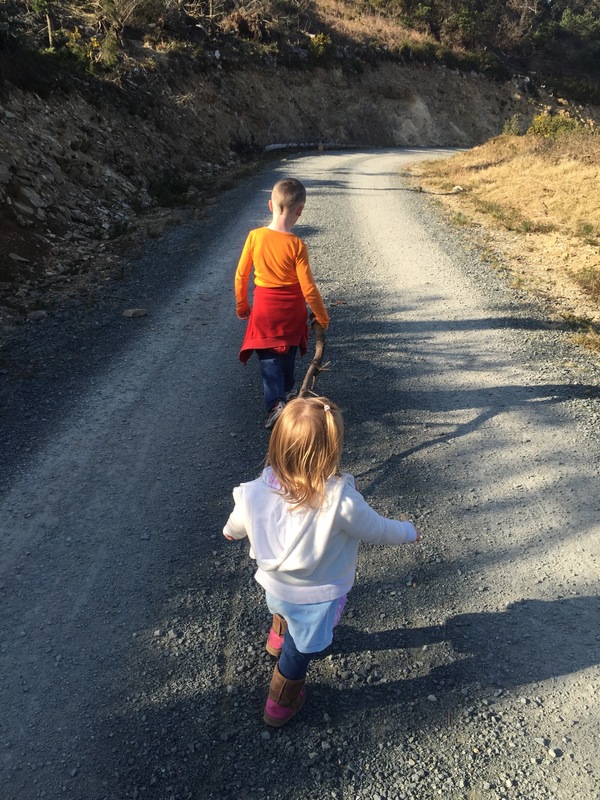 Miss Toddler wasn’t given a choice, she was unanimously voted to join the downward convoy. Small Boy elected to go all the way to the top with Daddy. Big Boy chose to stick with me and make our way downhill slowly. As far as anyone know we’re having a great time. We watched them leave and waved them off. We sat and rested, took selfies and photos of the view. The day got better because we took control and opted out. We took it slowly going down the hill. Miss Toddler pushed the buggy a bit then suggested the her brother should, but this proved to be a ruse to free my arms to carry her. She was coerced back into the buggy. Big Boy dragged a very large stick most of the way down the hill. Then he suggested he’d push the buggy, but this proved to be a ruse to get me to carry the very large stick. In a lightbulb moment he asked if I was going to let him bring the boy-height stick home. I confirmed that there was no chance. He gave me a dimpled grin and lobbed it into the ditch. He skipped along down the hill. We got back to the car and waited for the adventurers to return. Relieved that it wasn’t us climbing that hill any more. We learned a lesson today. Sometimes it’s OK to not want to climb to the top of the hill. Sometimes, it’s OK to quit. Sometimes it’s OK to be joyful giving up. Sometimes things get better when you resign yourself to failure. Commit to it. Sometimes, the photos lie and the day wasn’t all that good. But take the photos and your memory can filter out the whining and the snots. Unless you happen to blog about them. Oh well. 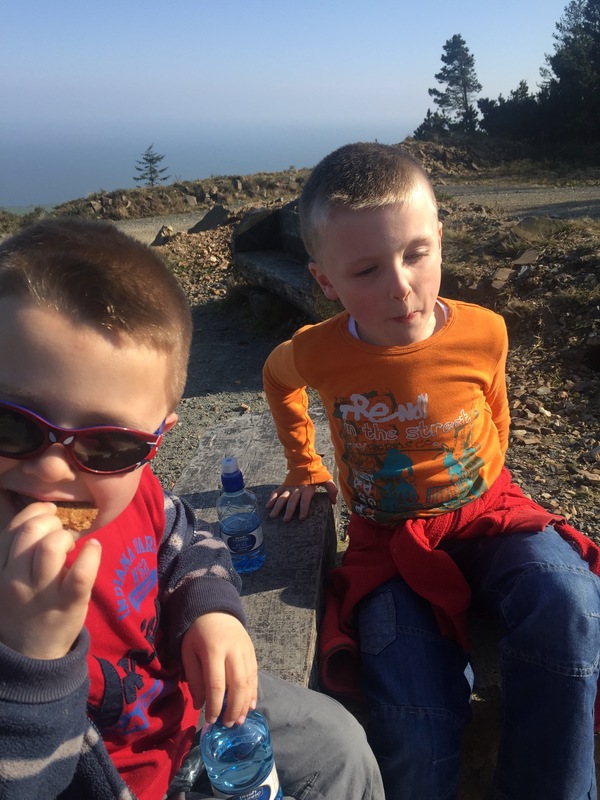 activities, family, family days out, lessons, tara hill, tourism, travel, wexford. Bookmark.